Thy Rod And Thy Staff. . .
God is a God of balance. He is always there to comfort and guide us. He is always there to discipline us. He holds the staff of direction and the rod of correction and protection. He protects us from the predators. He fights our battles for us. Just like a shepherd does with his sheep, God does with us. With His staff, He clears the way for us. 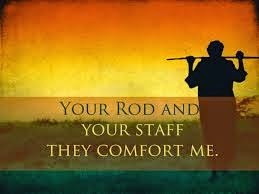 With His staff He comforts us. With His staff He directs us to the right path. He keeps us from the ditches and dangerous forests. He speaks to us. He tells us where to go, where the way is. His Word stands as the guide for us. The Word of God is a two-edged sword. Just like the word is available for instruction, it is also available for correction. Because God loves us He disciplines us. Man must expect both sides of the divide from God, as the need arises. You cannot pick the staff and leave the rod behind. The two are important for our ultimate survival. He knows just what we need per time. The Word ‘beats’ us back into His will. The Word ‘smacks’ us so that we can retrace our steps to Him. Yes, though I walk through the [deep, sunless] valley of the shadow of death, I will fear or dread no evil, for You are with me; Your rod [to protect] and Your staff [to guide], they comfort me (Psalm 23:4 AMP). We must allow Him do with us as He desires. We must yield to correction and walk in the way He leads us through. Only then are we safe. Only then do we have no cause to fear or be agitated. When we know He is with us, and we allow Him take charge of our lives, there will be no cause for alarm. We are rest assured that He will take care of us. May His rod and staff comfort us as we journey through life in Jesus’ name. . . Remember That You Are Man!